One of the most important features of any kitchen is the cabinets. The best kitchen cabinets are durable, accessible and pull together all your design elements. When you’re planning your dream kitchen it’s best to work with a dedicated kitchen cabinet supplier. Once you’ve found a local professional supplier, be sure to use these four steps to simplify your life and get a brand-new kitchen with less stress. Communication is a two-way street. You’ll want to clearly define your goals and ambitions, and listen to advice from your cabinet supplier. Suppliers are typically experts that have designed many kitchens, so you may be surprised to find that your dream kitchen ideas aren’t as perfect as you thought. Be open to new suggestions and you’ll get kitchen cabinets that match your style, price range and needs. Your dream designs may just be dreams. You may think it’s easy to tear down a wall, redesign a nook or create unusual cabinets to fit your desires, but some remodeling projects turn out to be too impractical to be efficient. Talk to your kitchen cabinet supplier about your ideal kitchen setup, but be ready to compromise and go with a backup plan if your first design isn’t a practical option. 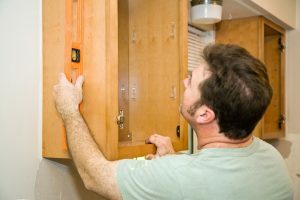 If your cabinet supplier needs to order or create custom cabinets, you may have to wait a few weeks or even months before they are ready. Good things come to those who wait. If you’re looking for a one-of-a-kind kitchen, you may need to have a little patience to make sure it’s pulled off flawlessly. Everyone loves a good deal. But when it comes to kitchen cabinets, you get what you pay for. There are advantages to shopping around and finding a good rate, but also be sure you hire an experienced professional cabinet supplier. Quality cabinets will last you a lifetime, so invest in a supplier that will deliver the designs and build quality that you want for your home.